I support the Second Amendment, but . . . . But even if it were repealed tomorrow, by unanimous vote of the full U.S. House, the full U.S. Senate, and all fifty State Legislatures, the pre-existing, civil, human right to own and carry weapons for defense of self, family and community doesn’t go away one bit. Look, no one is trying to take your government away. We just want to have an honest, open, adult conversation about common-sense restrictions on government. If we can save just one child from government violence, it will worth it. I am writing in support of Bernalillo County joining the Second Amendment Sanctuary movement that is here in New Mexico, and in other states around the nation. As for the sheriffs and county commissions that have already signed on, they aren’t the lawbreakers as they have been smeared as in the media. Rather, the public officials who use their offices to promote and promulgate victim disarmament legislation such as SB 8 are the true lawbreakers. No law shall abridge the right of the citizen to keep and bear arms for security and defense, for lawful hunting and recreational use and for other lawful purposes, but nothing herein shall be held to permit the carrying of concealed weapons. No municipality or county shall regulate, in any way, an incident of the right to keep and bear arms. Maybe I missed the amendment to the State Constitution that repealed Article II, Section 6? I don’t remember seeing such an amendment on the ballot during the 2018 election, much less passing with any majority of votes cast. Nor do I remember seeing such a repeal on the ballot in any previous election. Since Article II, Section 6 is still on the books as a valid part of the State Constitution, I encourage and implore the County Commission to “get right” with the law as it’s currently written, as opposed to doing end runs around the Constitutional bits with which they personally disagree. Thank you for listening to my concerns. Who owns you? Who runs your life? Who should — you or someone else? Freedom is the answer — what’s the question? Copyright © 2019 Mike Blessing. All rights reserved. This blog entry created with Notepadqq. Maybe I missed the amendment to the State Constitution that repealed Article II, Section 6? I don’t remember seeing such an amendment on the ballot during the 2018 election. How much liability will Balderas, Lujan-Grisham, or the legislators who pushed SB 8 assume should someone denied a firearm under color of SB 8 be injured or killed after the fact, say by a deranged ex-spouse? Most likely they will assume zero liability (don’t bother trying to sue them on this — they will invoke “sovereign immunity”) and skate away from any responsibility. After all, it wasn’t one of the Political Class that was killed or maimed, so who cares, right? RECENTLY, ATTORNEY General Hector Balderas sent a letter to 26 county sheriffs stating that, “As law enforcement officials . . . we do not have the freedom to pick and choose which state laws we enforce,” in reference to the “universal background checks” mandated by the newly-passed Senate Bill 8. So why is that Balderas is himself choosing to ignore existing State law, specifically Article II, Section 6 of the Constitution of the State of New Mexico: No law shall abridge the right of the citizen to keep and bear arms for security and defense, for lawful hunting and recreational use and for other lawful purposes, but nothing herein shall be held to permit the carrying of concealed weapons. No municipality or county shall regulate, in any way, an incident of the right to keep and bear arms. I don’t remember seeing amendment to the State Constitution that repealed Article II, Section 6 such an amendment on the ballot during the 2018 election. Maybe I missed it? How much liability will Balderas, (Gov. Michelle) Lujan-Grisham, or the legislators who pushed SB 8 assume should someone denied a firearm under color of SB 8 be injured or killed after the fact, say by a deranged ex-spouse? Most likely they will assume zero liability — If you sue them on this as they deserve, they’ll invoke “sovereign immunity” — and avoid any responsibility. After all, it wasn’t one of the political class that was killed or maimed, so who cares, right? First, I am writing to say that some of the legislation under consideration by the committee is not properly labelled as “gun control.” Gun control constitutes the safe, proficient, and proper use of a firearm — the four safety rules, stance, grip, sight alignment and picture, breathing, trigger operation, target selection, etc. Rather, the legislation in question (HB 8, HB 40, HB 83, HB 87, HB 130) is more properly called “victim disarmament,” in that the people most likely to be affected by it are the people who have the most reason to own and carry firearms for self-defense — the little old lady or the paraplegic who lives alone in a bad neighborhood, the five-foot-nothing 100-pound woman being stalked by a six-foot 200-pound deranged ex-boyfriend. The bad people (the criminals, terrorists, and violence-inclined mental defectives) whom the proponents of this legislation say will be disarmed by it most likely will not be affected in the least. If they want access to a firearm, they will have it, by hook or by crook. There are already 20,000 to 25,000 existing restrictions upon the pre-existing individual, civil, Constitutional, human right to own and carry weapons, which are supposed to be guaranteed against State infringement by the Second Amendment and Article 2, Section 6 of the State Constitution. None of these anti-liberty statutes has stopped a bad guy from obtaining a firearm when they want it. Laws already exist that prohibit felons, domestic abusers, foreign terrorists, incurable drug abusers and alcoholics, and mental defectives from obtaining, owning or carrying firearms. Laws already exist that prohibit the use of firearms (and other objects) to harm other people (murder, assault with a deadly weapon, etc.). I think it’s safe to say that all these laws have done is keep honest people honest, the same way locks on doors do. Those who propose further infringments upon individual liberty aren’t truly looking to improve the human condition at all, but seeking more power over others for whatever reasons. No good will come from these infringements — no good has ever come from these sorts of laws, and no good ever will. House Bill 40, by Representative Miguel Garcia, would require criminal records checks on private firearms sales at gun shows — a perennial target of the gun control crowd, even though studies show that these events are not a source of crime guns. House Bill 83, extreme risk protection order or “red flag” legislation sponsored by Representative Damon Ely, would authorize the seizure of firearms and ammunition from individuals without due process. Unchallenged statements made by a petitioner before a judge, alleging that someone is a danger to themselves or others in an ex parte proceeding — prior to any formal court hearing at which the respondent can be represented by counsel and present counter evidence — would be sufficient for law enforcement to enter that person’s home and confiscate their private property. House Bill 87 by Representative Deborah Armstrong expands the state’s “prohibited person” firearm law by purportedly incorporating federal firearm disqualifications. The bill would prohibit individuals convicted of certain domestic violence misdemeanor crimes or who are subject to a domestic violence protective order from purchasing or possessing a firearm, with violations being a criminal offense. However, the bill goes beyond the prohibited categories in federal law in several significant ways. The state law definition of “household member” — unlike federal law — specifically includes a person who is or has been a continuing personal relationship, which applies to dating or intimate partners who have never lived together. The bill would include, as firearm-prohibiting offenses, nonviolent misdemeanors with no physical contact between the parties (like harassment by telephone or email, or criminal damage to the property or jointly owned property of a “household member”). Unlike federal law, this bill would require anyone subject to a protective order to surrender any firearms they own, possess, or control to law enforcement within 48 hours of the order. Not only does this bill impose a mandatory surrender, it authorizes law enforcement to seize any guns that are in plain sight or are discovered pursuant to a lawful search. Similar legislation had passed the Legislature in 2017 but was vetoed by Gov. Susana Martinez. Significantly, the 2017 legislation contained other options for affected parties to comply with the firearm surrender requirement, including storing their guns with licensed firearm dealers, or transferring the guns to a qualified third party. These key alternatives are not contained in this bill. House Bill 130, sponsored by Representative Linda Trujillo, would make gun owners criminally and civilly liable if a child gains unsupervised access to an unsecured firearm. New Mexico already has a first degree felony child abuse statute on the books to hold adults accountable for putting children’s lives or health at risk in any manner. The tools exist to charge and prosecute parents or guardians in appropriate cases. Education is the key to protecting gun owners and their kids, not a state mandate on how one stores a firearm in his or her home. If you truly want to stop violent crime and terrorism, find out what motivates criminals and terrorists to hurt others, and address those concerns. House Consumer & Public Affairs Committee — The committee in which this legislation is sitting at present. I presently reside in House District 16, of which Antonio “Moe” Maestas is the present State Representative. I planned to get this into a newspaper, but it was too technical for the Guardian and too non-practical for Linux Voice. Then my free time ran out. Today I saw Barret Brown report (freenet mirror) on his 5 years court sentence for quoting a Fox news commentator and sharing a public link. Welcome to Freenet: The forgotten cryptopunk paradise! A long time ago in a chatroom far away, select groups of crypto-anarchists gathered to discuss the death of privacy since the NSA could spy on all communications with ease. Among those who proposed technical solutions was a student going by the name sanity, and he published the widely regarded first paper on Freenet: A decentralized anonymous datastore which was meant to be a cryptopunk paradise: true censorship resistance, no central authority and long lifetime only for information in which people were actually interested. Many years passed, two towers fell, the empire expanded its hunt for rebels all over the globe, and now, as the empire’s grip has become so horrid that even the most loyal servants of the emperors turn against them and expose their dark secrets to the masses, Freenet is still moving forward. Lost to the eye of the public, it shaped and reshaped itself — all the while maintaining its focus to provide true freedom of the press in the internet. Once only a way to anonymously publish one-shot websites into Freenet that other members of the group could see, it now provides its users with most services found in the normal internet, yet safe from the prying eyes of the empire. Its users communicate with each other using email which hides metadata, micro-blogging with real anonymity, forums on a wide number of topics — from politics to drug experiences — and websites with update notifications (howto) whose topics span from music and anime over religion and programming to life without a state and the deepest pits of depravity. All these possibilities emerge from its decentralized datastore and the tools built on top of a practically immutable data structure, and all its goals emerge from providing real freedom of the press. Decentralization is required to avoid providing a central place for censorship. Anonymity is needed to protect people against censorship by threat of subsequent punishment, prominently used in China where it is only illegal to write something against the state if too many people should happen to read it. Private communication is needed to allow whistleblowers to contact journalists and also to discuss articles before publication, invisible access to information makes it hard to censor articles by making everyone a suspect who reads one of those articles, as practiced by the NSA which puts everyone on the watchlist who accesses Freenetproject.org (reported by German public TV program Panorama). And all this has to be convenient enough for journalists to actually use it during their quite stressful daily work. As a side effect it provides true online freedom, because if something is safe enough for a whistleblower, it is likely safe enough for most other communication too. These goals pushed Freenet development into areas which other groups only touched much later — or not at all. And except for convenience, which is much harder to get right in a privacy-sensitive context than it seems, Freenet nowadays manages to fulfill these goals very well. The cloud was “invented” and found to be unsafe, yet Freenet already provided its users with a safe cloud. Email was found to spill all your secrets, while Freenet already provided its users with privacy preserving emails. Disaster control became all the rage after hurricane Katrina and researchers scrambled to find solutions for communicating on restricted routes, and Freenet already provided a globally connectable darknet on friend-to-friend connections. Blogs drowned in spam comments and most caved in and switched to centralized commenting solutions, making the fabled blogosphere into little more than a PR outlet for Facebook, but Freenet already provided spam resistance via an actually working web of trust — after seeing the non-spam-resistant forum system Frost burn when some trolls realized that true anonymity also means complete freedom to use spam bots. Censorship and total surveillance of user behavior on Facebook was exposed, G+ required users to use their real names and Twitter got blocked in many repressive regimes, whereas Freenet already provided hackers with convenient, decentralized, anonymous microblogging. Now websites are cracked by the minute and constant attacks have made it a chore for private webmasters simply to stay available, though Freenet already offers attack resistant hosting which stays online as long as people are interested in the content. All these developments happened in a private microcosm, where new and strange ideas could form and hatch; an incubator where reality could be rethought and rewritten to reestablish privacy in the internet. The internet was hit hard, and Freenet evolved to provide a refuge for those who could use it. What started as a student’s idea was driven forward by about a dozen free time coders and one paid developer for more than a decade — funded by donations from countless individuals — and turned into a true forgotten cryptopunk paradise: actual working solutions to seemingly impossible problems, highly detailed documentation streams in a vast nothingness to be explored only by the initiated (where RTFS is a common answer: Read The Friendly Source), all this with plans and discussions about saving the world mixed in. The practical capabilities of Freenet should be known to every cryptopunk. But a combination of mediocre user experience, bad communication and worse PR (and maybe something more sinister, if Poul-Henning Kamp should prove to be farsighted about project Orchestra) brought us to a world where a new, fancy, half finished, partially thought through, cash-cow searching project comes around and instead of being asked “how’s that different from Freenet?”, the next time I talk to a random crypto-loving stranger about Freenet I am asked “how is Freenet different from X which just made the news?” (the answer which fits every single time is: “Even if X should work, it would provide only half of Freenet, and none of the really important features — friend-to-friend darknet, access dependent content lifetime, decentralized spam resistance, stable pseudonyms, hosting without a server”). Right now, many years of work have culminated in a big step forward for Freenet. It is time for Freenet to re-emerge from hiding and take its place as one of the few privacy tools actually proven to work — and as the single tool with the most ambitious goal: Reestablishing freedom of the press and freedom of speech in the internet. If you do not have the time for large scale contribution, a good way to support freenet is to run and use it — and ask your friends to join in, ideally over darknet. Since the focus of Freenet has been on the big goals, there are lots of low hanging fruit; small tasks which allow reaping the fruits of existing solutions to hard problems. For example my recent work on Freenet includes 4 hours of hacking the Python based site uploader in pyFreenet which sped up the load time of its sites by up to a factor of 4. If you are an interested software developer and want to join, come to #freenet @ freenode to chat, discuss with us in the freenet devl mailing list and check the github-project. Welcome to Freenet, where no one can watch you read. No kingdom can be secured otherwise than by arming the people. The possession of arms is the distinction between a freeman and a slave. He, who has nothing, and who himself belongs to another, must be defended by him, whose property he is, and needs no arms. But he, who thinks he is his own master, and has what he can call his own, ought to have arms to defend himself, and what he possesses; else he lives precariously, and at discretion. — James Burgh, Political Disquisitions: Or, an Enquiry into Public Errors, Defects, and Abuses [London, 1774-1775]. If the people backing “Everytown for Gun Safety” truly cared about firearms safety, then why aren’t they helping fund firearms safety training, as does their “archnemesis,” the National Rifle Association? Instead, all they do is lobby and agitate for more restrictive laws upon the pre-existing civil, Constitutional, human individual right to own and carry weapons, as guaranteed by the State and U.S. Constitutions. Why are not criminal stabbings or slashings with knives ever referred to as “knife violence” ? Why are hit and run murders done with cars or trucks never called “automotive violence” ? Why are attacks using baseball bats, pry bars, hammers and pieces of steel rebar never referred to as “blunt object violence” ? Submitted to the Albuquerque Journal on Monday, 17 April 2017. As for the phrase “gun violence,” why are not criminal stabbings or slashings with knives ever referred to as “knife violence”? Why are hit-and-run murders done with cars or trucks never called “automotive violence”? Why are attacks using baseball bats, pry bars, hammers and pieces of steel rebar never referred to as “blunt object violence”? If the people backing “Everytown for Gun Safety” truly cared about firearms safety, then why aren’t they chipping in towards firearms safety training, as does the group they list as their archnemesis, the National Rifle Association? Why is it that not only is “Everytown for Gun Safety” not supporting gun safety training as the National Rifle Association does, its principals are actively working against such training by lobbying to have the places where most of that training would take place — shooting ranges — shut down using “nuisance” laws and zoning codes? If Michael Bloomberg and the other multi-millionaires behind “Everytown for Gun Safety” truly cared about gun safety, they would put their millions behind the construction of MORE shooting ranges, and the maintenance of existing ones. They would chip in for the creation of DVDs and online video shows that provide instruction on the safe and proficient handling of firearms. Instead, all they do is lobby and agitate for more restrictive laws upon the pre-existing civil, Constitutional, human individual right to own and carry weapons, as guaranteed by the Second Amendment of the U.S. Constitution, and Article II, Section 6 of the Constitution of the State of New Mexico. Copyright © 2016 Libertarian Party of New Mexico, Libertarian Party of Bernalillo County, New Mexico, CNM College Libertarian Club and Mike Blessing. All rights reserved. BE IT RESOLVED that the Libertarian Party of New Mexico opposes any policy which would deny access to any firearms or ammunition to any person solely for being placed on any government watch or no-fly list, and reaffirms its call to repeal and oppose any existing or proposed firearm and ammunition regulations. Copyright © 2016 Libertarian Party of New Mexico, Libertarian Party of Bernalillo County, New Mexico and Mike Blessing. All rights reserved. It’s easier for a teenager to get his hands on a Glock than a computer . . . or even a book. First, there’s these places called libraries that will let you read books without going through any paperwork at all. Quite a few of these . . . libraries . . . will let you check out books and — wait for it — take them home without so much as a simple background check. Nor do the librarians make you fill out federally-mandated paperwork asking you if you’re a convicted felon, fugitve from justice, illegal immigrant, been dishonorably discharged from the military, have been adjudicated as mentally unfit to read, have any domestic violence convictions, or if you’ve renounced your U.S. citizenship. And if you want to keep the book, you don’t go to a library, but to another place called a bookstore, where you can hand over some of your cash and take the book home with you. No background check, no waiting period, just pay for your book, take it and go. Nor do you have to be at least 21 years old to purchase small, easily-carried books. Why, they even let you buy or borrow multiple books without additional paperwork. WOW! Nor do the feds require bookstore owners to get a federal license to sell books across state lines. A mass-market paperback of the kind that I bought most of my books as ran at ∅2.50 (plus tax) back in the early 1980s. Now they’re up to ∅7.99-8.99. Trade paperbacks in the 6″ x 9″ format usually run ∅9.99-19.99, depending on how many pages, the publisher, etc. Hardbacks are pricier — they’re usually over ∅20, most likely in the ∅22-27 range (it does pay at times to check the remainder tables!). You can get a used desktop (such as the one I’m typing this article on) for about ∅100-200 (I paid ∅90 to a place that was going out of business). Used laptops are in the same price range. And as with books, there’s no need to fill out any federally-mandated paperwork, no waiting periods, no required background check, no age requirement. You can get a computer, even a brand-new one, even if you’re a convicted felon, messed up between the ears, been dishonorably discharged, etc., etc. As for the Glock, though, that’s a bit different. Brand-new, a Glock will run you about ∅500. Used, they can go for more or less, depending on condition and after-market modifications. A factory-model Glock in decent condition will cost you about ∅300. On top of that, if you’re a convicted felon, don’t get caught possessing that Glock by the cops — the feds love to throw people in prison for ten-year stretches for that. That federally-mandated paperwork and background check I linked to above? That’s the sort of thing you have to go through to purchase a firearms from a federally-licensed dealer. In order to sell firearms across state lines and on any sort of commercial basis, the feds require that the dealer get a Federal Firearms License [FFL]. So much for Obama’s comment in Dallas. He’s got advisors from the Cabinet secretaries and agency directors on down who could have offered up the correct information for his Dallas speech. It’s already bad taste to use a memorial service to score political points. On top of that, he used nonsensical comments to score those points? Come one, now. 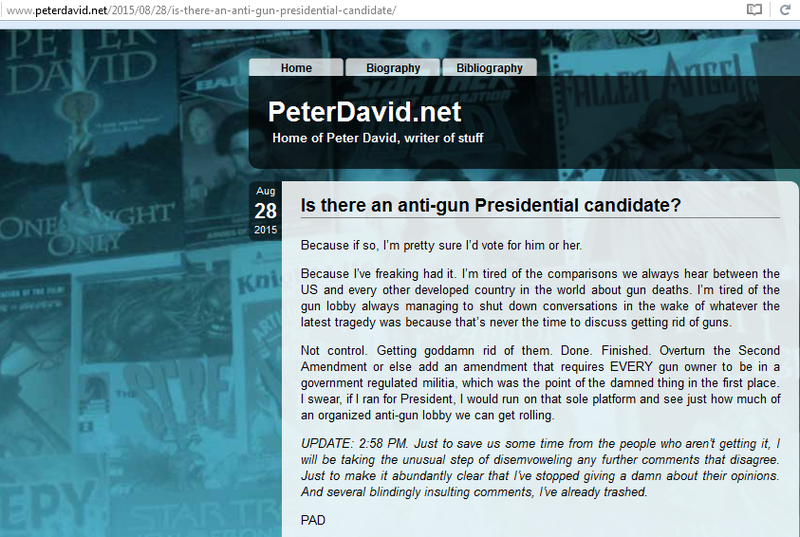 The first is an old one, from August of last year, from science fiction, fantasy and comic book writer Peter David, which is a shame, as David can be a good writer when he wants to be. Still, at least he’s honest and up-front about his desire to disarm America’s population, which is more than I can say for most hoplophobes and victim disarmers.